JEDP Hypothesis, Q Theory, and the Critical Text... Oh My! You are here: Home / JEDP Hypothesis, Q Theory, and the Critical Text… Oh My! 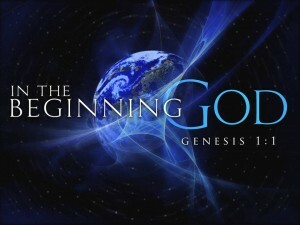 Question: Genesis 1 and Genesis 2 appear to be written by different people. How is your understanding on this? Yes, Genesis 1 and Genesis 2 do appear to be written by different people. Bible scholars have noted that different names of God are used in these two chapters, along with different terminology, different themes, and even a somewhat different order of events. These differences aren’t just with Genesis 1 and Genesis 2, of course, but with the entire Pentateuch. This has led some scholars to suggest that there were maybe 4 authors (or groups of authors) for the Pentateuch, and they can be identified by their emphasis and by what name(s) for God they seemed to have preferred. 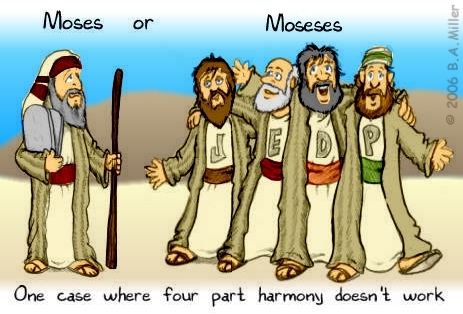 This theory is called the Documentary theory or the JEDP hypothesis, and the four authors (or groups of authors) are identified as the Yahwist (J), the Elohist (E), the Deuteronomist (D), and the Priestly (P). According to this theory, it is believed that the Priestly author wrote Genesis 1:1-2:3 and the Yahwist wrote Genesis 2:4ff. Ever wonder what you learn in Seminary? This! So what do I think of this theory? Well, I take an approach similar to how I approach a similar theory about the 4 Gospels in the New Testament. Conventional scholarly wisdom about the 4 Gospels says that there is a “Q” source document for the Gospels which has been lost. It is believed that Matthew and Luke had this “Q” (along with the Gospel of Mark) and used it to write their Gospel accounts. I have never completely caught the disease called Q, though from time to time I have experienced that shivery feeling, and the concomitant double vision, that those who have a chronic case of the Q disease reveal as their normal state. I have experienced, though, an interesting phenomenon: my inability to make up my mind on the synoptic problem has not, I think, in any way impaired my ability to read Matthew, Mark, and Luke as Matthew, Mark, and Luke, nor indeed my ability — though some would no doubt question this — to think and write about this historical Jesus. So anyway, my view of the JEDP hypothesis is similar. I honestly believe Moses wrote most of the Pentateuch (probably all of it except the last chapter of Deuteronomy). Did he have sources? Probably. He likely had some documents or oral traditions from which he drew, and which might account for the differences in the various texts. Here’s my main concern: Why do modern biblical scholars do not give the same freedom and flexibility to biblical authors that we allows ourselves? Look, I have been writing for about 20 years. If I go back and look at the themes I wrote about 20 years ago, the words I used, the way I thought about God, the names I used for God, and a whole host of other ideas, the “me” of 20 years ago writes nothing like the “me” of today. Even if I wrote something today and then sat down tomorrow to write it again without looking, I am certain I would phrase things different, write with a different emphasis, and refer to God in different ways. This is true of all authors around the world and throughout time. Cannot this also be true of biblical authors? Of course it can! I sometimes think these documentary theories are nothing more than scholarly inventions to give scholars something to write about who have become bored with the biblical text itself. So to answer the original question. Were Genesis 1 and Genesis 2 written by different authors? No, I do not believe so. I believe Moses wrote both, though I believe that he may have used different sources or oral traditions to record the two accounts, but even then, both are accurate and simply reflect two different thematic perspectives on the creation account. So do I believe in the JEDP hypothesis? Not really. Just like I don’t hold to the Q theory either. But guess what? Just as N. T. Wright wrote above that a rejection of the Q theory doesn’t keep him from understanding the Gospels, the rejection of the JEDP hypothesis doesn’t keep me from understanding the creation account or the rest of the Pentateuch. In Genesis 1-2 we can still see a beautifully constructed polemic against the Egyptian and Canaanite creation myths that were common in the days of Moses. Wait… what? Am I saying that Genesis 1-2 do not offer a scientific treatise on how the universe began? The point is this: While the question of authorship is vitally important for understanding Scripture, the question of meaning is even more significant. In other words, the question “What does the text mean?” is way more important than the question “Who wrote this text?” And whether you believe Moses wrote Genesis 1-2 or some nameless Priestly author and Yahwist, you can still find great truth in the message of the text itself. The theory is popular because there’s something to it. If you believe Moses used multiple sources when he wrote the Torah, functionally you do believe the JEDP theory: Moses was the final, God-inspired editor (and arguably P, and in his later years D) who put the multiple sources together, though a bit ahead of the usual timeline. We write articles. We quote other sources, or read ’em and bring their ideas into our discussions. Same kind of thing. Common custom (and courtesy) means we refer to our sources whenever we quote them directly, but Moses didn’t have to do any such thing. So if, as is likely, he quoted E for Genesis 1, and J for 2, he didn’t say, and didn’t have to. Yes, I know I believe a version of the JEDP theory. I don’t mind if Moses used sources (or if Matthew and Luke did either). This is the way we all write, as you point out. But the real JEDP theory states that large chunks of the Pentateuch wasn’t written until much later, maybe during the divided kingdom era or even later, during the rebuilding of the Temple after the Babylonian exile. I think the dates are in that graphic in the post above. That part of the theory I do not accept. That’d be where I differ as well. I see no compelling reason for a late authorship of those books. (For that matter I believe there’s more evidence that the Exodus took place in the 1400s BCE, not the 1200s as many scholars assume.) But I’m okay with the general idea of the JEDP/Wellhausen hypothesis; just not his specific conclusions. Could the Didache have been Q? I’ve never heard it proposed, perhaps for good reason…?? We make the Bible the ultimate authority, words breathed word for word from the mouth of God. Then we decide exactly what those words say, and end up with an iron-clad case for or against all sorts of things. Somehow, in all this, we forget Jesus. His life. His words. We neglect to do what he said, to love God with all our being and our neighbors as ourselves. We convince ourselves that trying to enforce the letter of Scripture, as we understand it, as has been taught to us, fulfills loving God with all our being and our neighbor as ourselves. Are the JEDP hypothesis and the Q theory accurate? Perhaps, partially so, as you point out. But whether they are or not, are we living in the Kingdom Jesus announced? Are we living out the simple truths of that Kingdom? Or as you say “I sometimes think these documentary theories are nothing more than scholarly inventions to give scholars something to write about who have become bored with the biblical text itself.” That is, have the endless Bible studies, endless dissection of Scripture and endless theories, interpretations and discussions taken the place of actually following Jesus in His Kingdom? Have we become bored with the Bible itself and with the idea of following Jesus? Often times I think we have. We may not sit around endlessly discussing how many angels can dance on the head of a pin, but we do spend our lives on religious and supposedly Biblical discussions and investigations of similar import. Yeah, this may be one of those “angels on a head of a pin” debates. Although….. as strange as it may sound….. and here I’m revealing my love of all things theology….. (get ready to sigh and roll your eyes)…. even that debate about the angels on the head of a pin had some merit (though actually I think it was the point of a needle). The debate is an argument about the nature of the spirit realm, specifically, about whether or not beings of the spirit realm took up any “space.” Why is that important? Because “God is Spirit” and if angels take up “space” then we need to ask how God takes up space. And if angels and God take up space, then we need to ask whether or not they require time to move through space….. this then would affect central ideas of theology about the immensity and omnipresence of God. But, on the other hand, if angels do not take up space, then the question is this: “Are angels then also omnipresent?” If they do not take up space, then are they everywhere at once like God? All of this, of course, has ongoing ramifications for how we view our lives within the Kingdom of God, and the spiritual influences upon our life as we seek to follow Jesus into the world. Should I expect to encounter Satanic roadblocks, or should I not? Should I believe that angelic messengers can help me when I pray for aid, or will it take some time for them to arrive from God? Is angelic/demonic spiritual warfare a matter of numbers, as it is in physical warfare? Similar arguments could be made about the JEDP theory. If the JEDP and Q theories are correct, then what does this say about the Gospel accounts and the instructions of Jesus which we seek to follow as we live our lives according to the Kingdom of God? Maybe all we have in the Gospels is a big “wish” of some first century religious writers, and we shouldn’t seek to follow it at all, because the authors were colluding with each other to gain power and influence for themselves and spark rebellion against the Roman Empire….. Anyway, ultimately, I agree with you. But I think it comes down to balance. Hard questions must be asked so that hard decisions can be made about how best to follow Jesus and live out the truths of the Kingdom. As you might suspect, I don’t think they got it right on the angels, space and time discussions. I’m curious – Do you suspect angelic messengers have shown up in your vicinity? I think that the writers of Scripture often used verbal and written sources that they thought were reliable. The Gospels may not present the words of Jesus, but I think they do. I doubt some first century writers made up most of them. Those words would not have served their purposes nearly so well as ones they could have made up. I think theology understood is living in the Kingdom Jesus announced. It is much more than the dusty halls of academia. It is following the living Jesus among his people, knowing them, loving them, touching them. I have no idea about angelic messengers. You are right though that theology and the Kingdom of God should be tangible rather than mere theory. I have done my fair share of ‘scholarly’ study and been studying scripture for near 35 years seriously. With that said (an homage to my great humility-lol) I have noticed a tendency of textual critics (and many others too) towards a version of elitism. By this I mean, they assume they know more than the authors. I’m not sure why we look for unknown sources that no one can know (hmmm). With all that said, could Moses had sources such as ‘The Book of Adam’, of course. Is it possible God said, ‘Moses here’s how I created everything…in the beginning…’ Duh yeah. I guess I’m a little naive to believe the creator of everything could use ANYTHING to make Himself known. Great points, Tony. I agree with you. I think C. S. Lewis called this “chronological snobbery.” It is where scholars of today (separated by time and culture and geography) think they know more than the authors and scholars of the past who actually saw and witnessed the events they wrote about. I agree! Though I like to delve in and look up facts, view commentaries, decipher vocabulary, etc., I find sometimes that there is too much “theological” discussion rather than being open to spiritual and carnal advice. I find myself at this point sometime, enjoying the educational process more than my relational process with Jesus! I reign myself back! At this point I journal by writing verses, prayers until the Spirit speaks to my heart. That sounds like a good practice, Catherine. Study is important and can be worshipful, but we must balance study with practice and obedience. Glad you found a good way to balance both. 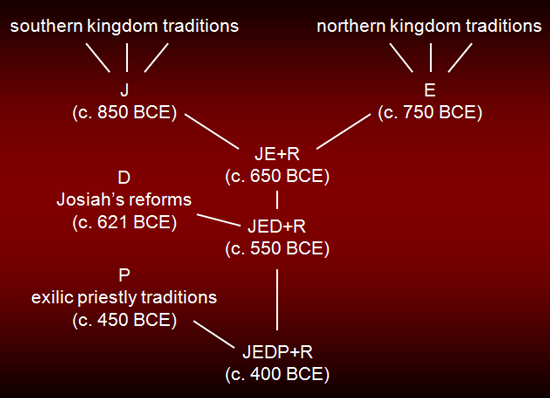 I think one of the implications of the JEDP theory is that a great amount of Israel’s history was invented. But I think it’s time the seminaries caught up with archaeology! No problems on not commenting for a while! Glad to see you are still lurking about. Also glad to see you are studying up on JEDP. Those are excellent points you make about the origins of this theory. I didn’t know about the recent archaeology finds which contradict the theory. Thanks! I wish I had found a picture for my article as good as yours!